From Betsy Frost - A Sterling Silver scallop shell necklace adorned with a Gold Vermeil sea star. This piece is reversible, and can be hung from either the base or the outer edge of the shell by hidden bails. 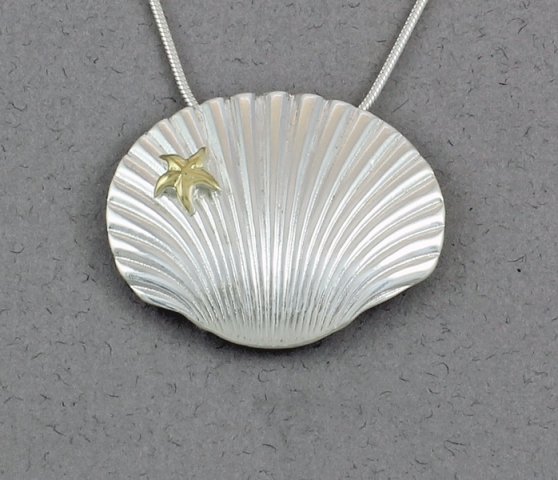 The pendant measures approximately 1" in height by 1 & 1/4" in width. Included is a Sterling Silver snake chain, 16" in length plus a 2" extender. Made from Argentium (non-tarnish) sterling silver. Argentium Sterling silver is a modern sterling silver alloy which modifies the traditional alloy (92.5% silver + 7.5% copper) by replacing some of the copper with the metalloid germanium. It contains at least 92.5% Silver, and is still regarded as sterling silver. Betsy's designs are fluid - reflecting her early training in dance and gymnastics. She prizes shape and movement over surface texture and color, and brings her jewelry alive with links and hinges in a way that is comfortable to wear, yet fun and aesthetically pleasing. 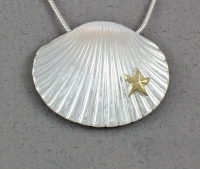 Betsy works primarily in sterling silver.